Sardine Power Lunch - A recipe from Savor California, the online showcase for extraordinary gourmet foods and beverages from California. Coarsely mash the avocado with lemon juice to taste. 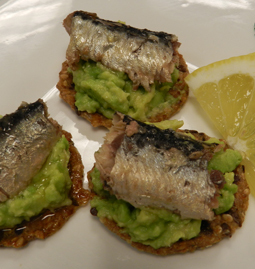 Spread onto crackers and top each with a piece of sardine. Add another dash of lemon juice and a dash of hot sauce, if desired.